SAN DIEGO (California) – Chevrolet invited us to California to drive an all-new five-passenger crossover. We were promised a vehicle that’ll compete against a Nissan Murano, a Honda Passport and a Ford Edge. We then got the usual spiel about its design, technology and sportiness. Oddly enough, this new SUV had the name of another vehicle glued onto it. Why on God’s Earth was it written “BLAZER” on its doors? While absent for over a decade, the Blazer name has been around for quite some time. It was first introduced in 1969 as an adventure machine aimed at taking on new off-road vehicles such as the Jeep CJ, the Ford Bronco and the International Harvester Scout. And it lasted quite a while. By the early 1990s, the Blazer was so popular that General Motors sold two of them, a small one and a big one. At the end of its career, even though it was easily outpaced by more fuel-efficient utility vehicles like the Toyota RAV4 and Honda CR-V, the Blazer remained a rugged all-terrain SUV, one that could lock its two differentials on demand, and send power straight to its rear wheels if you asked it to. The new Blazer does none of that. This is an entire different vehicle; an urban machine, a “dynamic” and stylish one at that. And honestly, it looks rather good! Here’s an interesting fact: the two designers at the head of the Blazer’s design team are Korean. When we asked one of Chevy’s leading engineers if we’ll see an off-road version of this thing in the near future, he simply rebutted by saying that the Colorado ZR2 currently occupies that space. It’s clear then that Chevy has no plans to manufacture a more adventurous trim level for its Blazer. That name is nothing more than a marketing stunt. 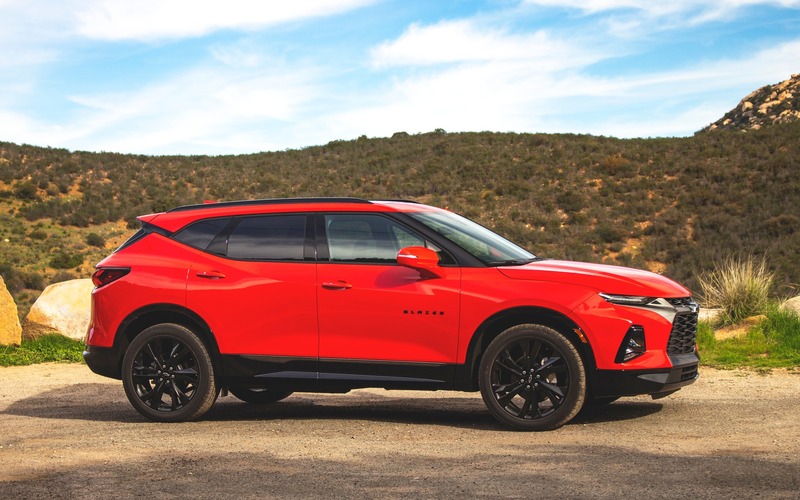 But if we are to observe the 2019 Chevrolet Blazer from another angle, like the segment it sits in, it’s refreshingly good. So good in fact that if you had to choose between this Blazer, a Nissan Murano or a Ford Edge, we’d tell you to opt for the Chevy. One of the reasons is its drivetrain. Two engines power it, either a 2.5-litre four-cylinder engine good for 193 horsepower and 188 lb.-ft. of torque, or a 3.6-litre V6 that churns out an impressive 305 horsepower and 269 lb.-ft. of twist. Notice how each engine isn’t fitted with a turbo? They’re naturally aspirated for a reason; to ensure optimal throttle response at all times. This philosophy was also applied to the transmission. 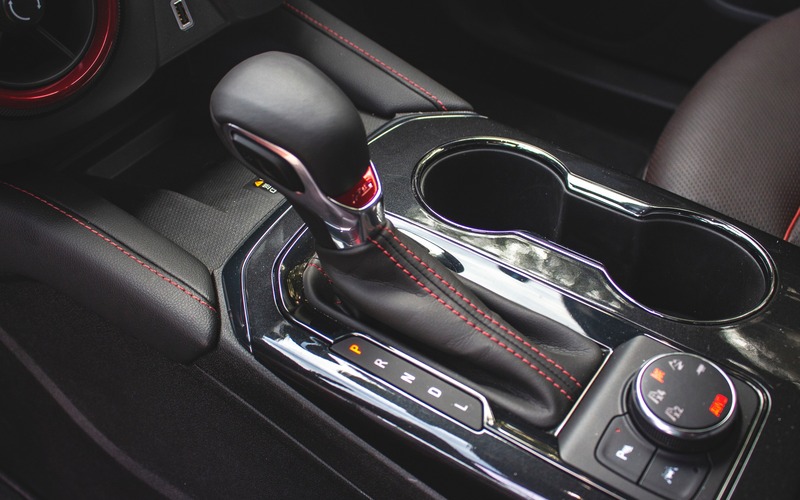 No CVT here, but GM’s fantastic nine-speed automatic unit, a gearbox also found in the Chevrolet Equinox and Traverse SUVs. Front-wheel drive comes standard with the four-cylinder engine. 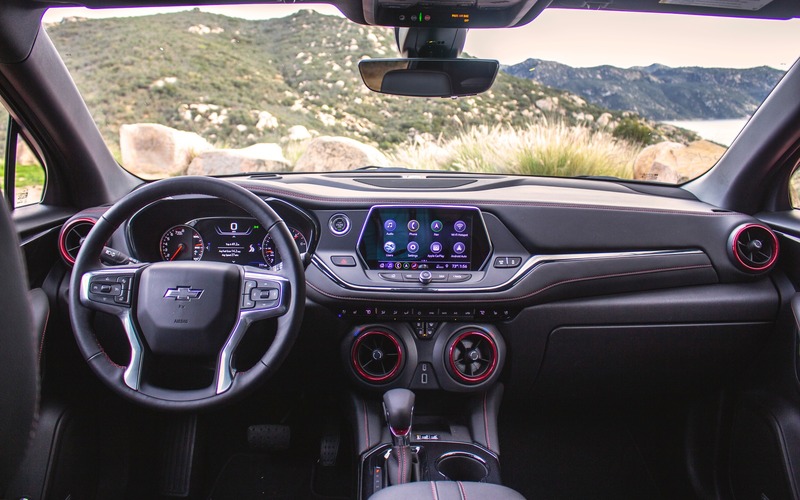 All-wheel drive can only be had with the V6, but consumers can opt for a front-wheel-drive Blazer and six-cylinder power. As we’re writing this, Chevrolet has no electrification plans for its newest member. Three trim packages, or as Chevrolet likes to call them “personalities” are offered: Blazer, Premier and RS. The latter is the sportiest one of the bunch, adding a torque vectoring all-wheel drive system, a sportier suspension setup, larger brakes and a more aggressive look. Since it’s the most interesting model within the Blazer range, we spent most of our time driving that one. If you find that the Blazer looks like a lifted Camaro, that’s no coincidence. Chevrolet engineers and designers worked extra hard to inject some sportiness into it. For instance, while it shares its platform with the GMC Acadia, the Blazer’s front track is 158 mm wider than its cousin’s. Proportionally, it’s about the same height as an Equinox, but as wide as a Traverse. The end result is a significantly lower centre of gravity than those of its main rivals, allowing the Blazer to be better planted to the road. And it shows. While we were driving the thing on twisty California roads, our Blazer had no issue attacking a corner quickly. No tire squeal in sight, or unwanted body roll you’d expect from such a vehicle. Exiting corners actually proved to be more fun than we anticipated thanks to that torque vectoring system, which transfers power from the rear inside wheel to the outside one. This in turn helps the vehicle rotate better, thus improving overall grip. 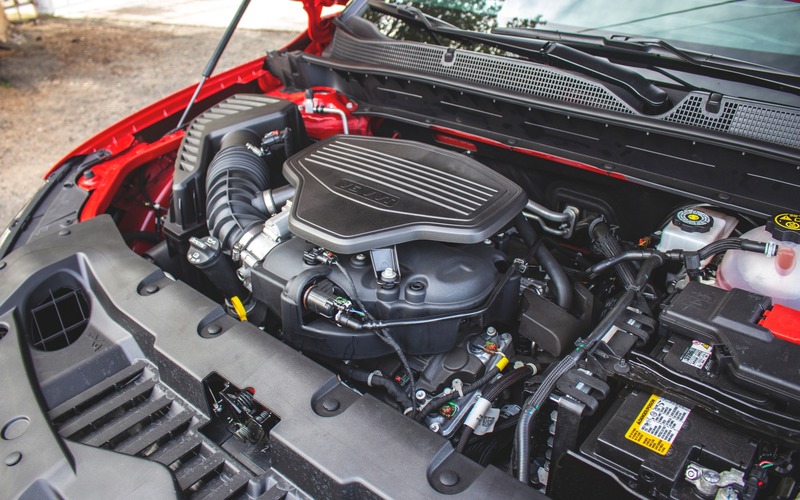 In the handling department, the Blazer RS is in the same league as a Ford Edge ST.
And what an engine! We not only adore the V6’s throttle response, but also the way it sounds and loves to rev, forcing the driver to repeat the experience. We also have no complaints about the automatic gearbox. It executes commands quickly and without fault. Rare are automatic units that downshift three times during a single pedal movement, and GM’s setup delivers like a champ. The Blazer’s performance theme continues inside where you’ll find the same large air ducts as in the Camaro. The dashboard itself is as stylish as the car itself. It’s all well put together, with easy-to-grasp and intuitive controls. Meanwhile, Chevrolet’s MyLink infotainment system remains a leader in ergonomics by being simple and easy to use. Android Auto, Apple CarPlay, Spotify, Teen Driver, even a Wi-Fi hotspot (subscription required), they’re all there. As for everyday utility vehicle duties, again, the Blazer doesn’t disappoint. Once equipped with the proper tow package, it’ll pull up to 4,500 lbs. (2,041 kg). Granted, that’s a little under a Honda Passport (5,000 lbs. (2,268 kg), but still more than a Nissan Murano (1,499 lbs. / 680 kg) and a Ford Edge (3,500 lbs. / 1,588 kg). Even when it’s powered by the four-cylinder engine, the Blazer can tow up to 1,500 lbs. (680 kg). But there’s a slight catch. 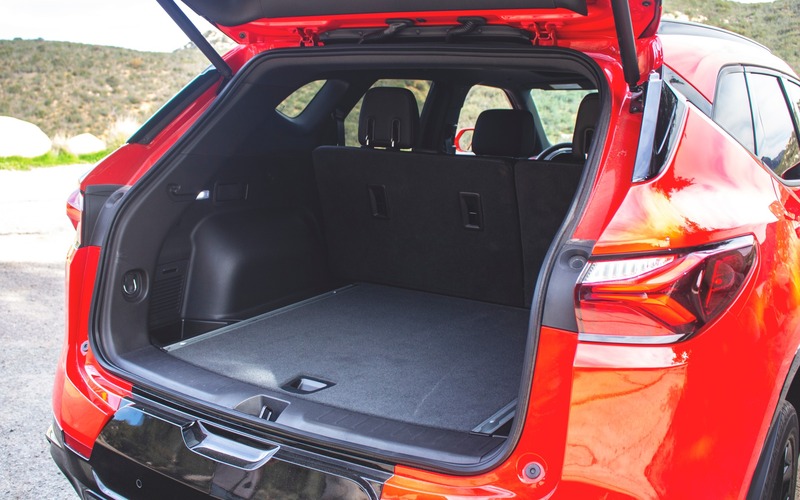 While its cabin is spacious and comfortable considering its compact exterior dimensions, the Blazer’s cargo space is a tad under its main rivals. At 1,818 litres of total space, the Blazer is slightly outgunned by the Murano’s 1,897 litres, and significantly behind the Edge’s 2,078-litre capacity. Hey, no vehicle is perfect. Anyway, the Blazer sits in a segment where consumers aren’t exactly sure of what they need; nor a car, nor a truck. At least it delivers while not being too clumsy along the way. So yes, technically, the 2019 Chevrolet Blazer does more than what its target buyer asked for. It performs superbly well in the twisties, and rather quickly too, all while providing plenty of capability to its owner. It’s a vehicle that’ll undoubtedly sell well, and rake in a few prizes from the automotive press along way. We only wish it had another name. 3.0/5 We focused our drive primarly on the RS model. Under spirited driving, we recorded an average of 11.6 L/100 km, which is okay within the segment. 4.0/5 The Blazer is comfortable both front and rear. That adjustable rear bench helps a lot. 4.5/5 In RS trim, the adorable V6 engine, perfect-shifting automatic gearbox and impeccable chassis dynamics translate into a rather good performer. 5.0/5 Chevrolet MyLink is currently a leader in simplicity and user-friendliness. It comes with all the connectivity features you can imagine. 4.0/5 Even the Premier model (V6) performs admirably well. It's well planted to the ground and surprisingly fun to push to its handling limits. 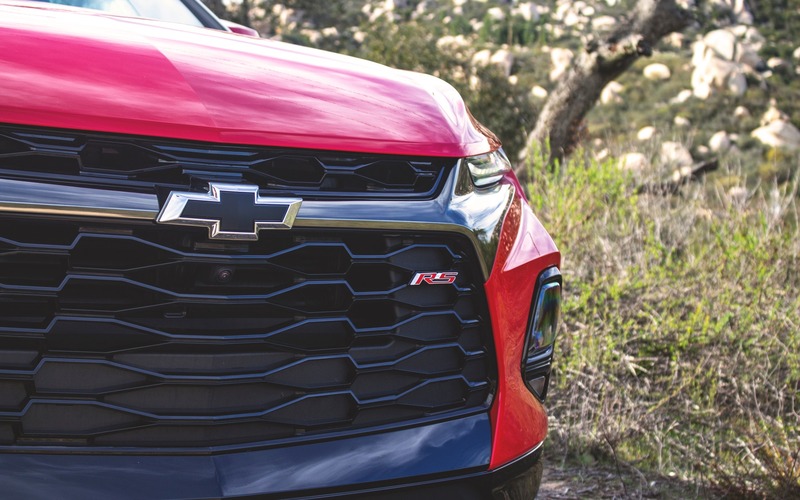 4.5/5 While it wears the wrong name, and its cargo space is a tad on the small side, the 2019 Chevrolet Blazer beats its rivals in driving dynamics, styling and technology.